Kiran Nagarkar, well-known novelist, floated the idea during his recent interaction with activists that some kind of a rasta roko agitation could be held to check the growing congestion caused by cars, to assert people’s right to the road and to help increase the speed of BEST buses. The car lobby , the traffic police and the whole establishment will surely not relish this. But they should remember that their policies actually are resulting in rasta roko for millions of people every day in the whole country. So a rasta roko against cars for a few minute should not cause much alarm. Think of this idea which emerged from James C Scott, the author of the book Weapons of the Weak and professor of political science at Yale university .He was watching traffic in a small town in East Germany in 1990 a few days before the unification. He noticed that scores of people patiently waited at a traffic signal for a long time even though there was little vehicular traffic. The traffic system, he felt, was unjust and people should cross the road as an act of defiance of unjust rulers. He argued that these little acts of resistance are essential to prepare us for bigger struggles ahead. Mr Scott is a widely respected scholar who has done a lot of research in south east Asia studying the lives of the poor. If one studies his writing it can be surmised that the suppression of the BEST bus system in the last few years is a deliberate attempt to wear down the poor , reduce their power of resistance. He has cited an example from Massachuseets in the U.S. where the bureaucracy used various means to deny welfare benefits to the poor. It could not openly do so. So, it made life difficult for the poor so they would find it difficult to get the benefits. Let us see how the system resorts to Rasta Roko against common people every day. 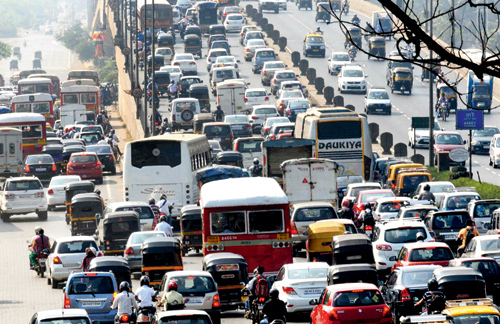 Turner road or Guru Nanak road is an important arterial road in Bandra West which the government now wants to connect to the proposed coastal road. So, it is quite a key road. Here the pedestrian crossing time given is just five seconds. The fittest person would not be able to cross even half the road. So one has to wait for another 180 seconds or so at the intersection breathing poisonous fumes emitted by cars. This is the 50th year of the student protest movement of 1968 which created a great awakening among people and gave a new light of hope. Those days are recorded in the book Street Fighting Years written by Tariq Ali, a stalwart of those days. And the word street fight need not cause alarm. It is the title of a book by Janette Sadik Khan, former traffic commissioner of New York, who brought in a number of reforms in the city by reducing access to motor cars and bringing some kind of a democracy to roads. She had to fight vested interests and so the title of the book. Walking, cycling, taking public transport are little acts of resistance against a car-dominated, capital-dominanted unjust, unequal transport system. Since we are on the issue of BEST, let me recall a statement often made to me in his retirement days by Mr J.B. D’souza, former BEST general manager and then municipal commissioner and chief secretary of the Maharashtra government. He used to say that there appeared to be conspiracy against pedestrians. His wife, Neela D’souza, writer, keeps up the fight and walks daily on the roads of Bandra west at the age of 82 battling motor car traffic. She seldom uses a car and for walking seldom chooses the confines of Joggers Park. As for the illiberal ideas of the governing class in India about subsidies to public transport, let me cite an editorial in the New York Times last month which fully supported a proposal of the New York city council to give a subsidy of 212 million dollars a year to give discounted fares to nearly eight lakh poor people. We can improve the lives of the people in a single stroke, the editorial said. The editorial makes it clear that it has the backing of the editor, the publisher and the editorial board. This editorial and the huge subsidy tells us a lot about the changing nature of thinking on urbana transport in several Western countries. There is a big tide in favour of public transport and against motor car dominance. I am afraid there is a terrible deficit in knowledge in Maharashtra’s ruling circles, the governance system. We are severely running down our public bus transport in the city and in the state. There are serious transport problems in Mumbai not only regarding BEST buses, but also ST buses of the Maharashtra State Road Transport Corporation as well as long distance private buses. The Metro rail construction work has literally bulldozed the compound wall of the head office of the state transport headquarters opposite Mumbai Central rail terminus. It is making further inroads into the compound. I visited the premises on May 10 and clearly entry is not easy even for the managing director Ranjit Singh Deol, or transport minister Diwakar Raote, who is the chairman of the corporation. The main road Anandrao Nair Marg is now out of bounds for ST buses and they have to take a long diversion via Byculla area. It takes our driver of long distance ST buses three hours simply to reach Panvel from Bombay Central.That leaves him exhausted, said an official. Even before the Metro, things were no better. And for pedestrians walking towards the ST bus station or for motorists there is no end to misery especially if they are coming from the Maratha Mandir cinema theatre side. For ST bus operations there were serious traffic problems even before the Metro completely took over the area. Despite all handicaps,ST buses are far more punctual, reliable and affordable than private buses. The ST bus network at least has some primitive infrastructure in Mumbai. The private operators do not have even that. They operate from the roadside. It is a common site to find families wait patiently for hours together at some street corner or under some shelter with little children and luggage. The entire long distance private bus operations in the city and elsewhere is illegal. These buses are licenced to operate only from point to point without intermediate stops, their mechanical condition is poor, breakdowns are frequent even in the case of big operators. Some of these vehicles carry out illegal modifications. Their safety record is not considered good. The Mumbai high court has passed severe strictures against the state government for failing to take action against these operators. These private buses heavily eat into the earnings of ST buses.. Four thousand private buses heavily outnumber the 1500 of ST in Mumbai. It is also more fashionable to travel by private buses, ST buses are considered down market, even though actually they are more efficient and punctual. The ST corporation now proposes to make some amends and provide modern bus stations at Nancy colony, Borivali, Panvel, Bhiwandi and Kalyan. The Kalyan bus station will be integrated with the railway station and taxi and auto stands. Mumbai’s progress is all right in terms of the suburban rail network, airport, car traffic but is primitive when it comes to public sector road transport which is such a pity. Regarding the BEST controversy the views of Dr Shanker Keshav Modak, transport economist, deserve some consideration. He is now 85 and at this age he has no axe to grind. So when he says the BEST bus fare should be actually brought down, we need to take this more seriously. Any increase in fare or reducing routes , as proposed by the civic body, would be suicidal. He knows about this subject particularly because he has studied BEST fare hike in the seventies. He suggests that the minimum fare from the present Rs. 8 should be brought down to Rs. 6 or the psychologically more appealing figure of Rs.5 which makes transaction easier. He taught transport economics in Mumbai university’s economics department before becoming principal of Sydenham college and Elphinstone college. Mumbai university has a chair in transport economics in the name of former industrialist Walchand Hirachand. Dr Sriraman used to be there as professor some years ago. One hears little about this department these days. Dr Modak is far from being a left-winger . But he is a strong supporter of public transport and thinks the government must muster courage to check the automobile lobby. A lot of mobility problems in Mumbai can be dealt with with a little imagination and little expense. A female British employee of Tatas in Mumbai rides by bicycle to work every day . She asked the management for a bicycle parking facility and got it promptly in Trent Tower at Bandra Kurla complex. Instead, our administration creates more and more problems for the common man by encouraging congestion by cars. The Tata employee’s husband is also an avid cyclist. Both are said to be almost six footers. That is only incidental. Anyone can ride a bicycle. Unfortunately, there is too much timidity in our society, so people don’t want to ride a bicycle. True, we need to be careful, but problems can be easily surmounted if more and more people take to cycling, that will deter arrogant motorists. The authorities mechanically created a cycle track in BKC but it is serving little purpose as there are no supporting facilities and this requires a lot of social engineering. What we have is a very mindless, civil engineering approach without any concern for the human angle. The Tata connection reminds me. Darbari Seth, the chief of Tata Chemicals, used to ride on a bicycle in the Mithapur plant in Gujarat. Our IIT campuses can start by restoring the bicycle culture. The father of Jairam Ramesh, former minister and ex IITian used to cycle in the IIT campus in Powai when he taught there some years ago. The bicycle is the predominant mode of transport in the campuses in top universities in the world. But we believe in importing the worst car-oriented models from the West while rejecting the best. Like Kiran Nagarkar, creative writers have played a great role in helping improve life with their ideas and convictions. The sterling work done by A.J. Cronin as a novelist led to the creation of Britain’s famous national health service. Cronin, a medical practitioner, worked for several years in the coal mine areas in Britain and his novel Citadel written in 1937 depicted the alarming effects of pollution on workers. There are multiple, well recognized reasons, why we should strongly oppose car dominance.Besides, new technology cars are doing more harm than before. The New York Times reported recently that carbon monoxide emissions from keyless cars have caused 28 deaths since 2006. Leaving the car engine idling in the garage proves fatal if the invisible odorless gas finds its way into home. The crimes of auto manufacturers are widely known but little action is taken as governments often act as their agents rather than regulators. And rich motorists get away with driving violations because of their economic status. Surprisingly, while the society shows such aversion to tobacco smoking because of its harmful effects, no such awareness is shown about cars. This is partly because many of us are so heavily implicated in the driving culture with all its harmful effects. How lightly we take serious offences, or shall we say alleged crimes, committed by the rich with respect to cars is best illustrated by the example of Navjyot Singh Sidhu, well known cricketer, popular television commentator. He punched a man over a car parking dispute in Patiala in 1988 after dragging him out. The man died subsequently. The high court sentenced him to jail for three years in 2006, then the Supreme court stayed his conviction and now he has been let off with a small fine. This reminded a facebook friend of an incident in the U.S. in 1963 in which an Afro-American barmaid,51, a mother of nine children, died after a blow from a cane by a wealthy white tobacco merchant during a party in the days of racial segregation .. The assailant got away with six months in jail, away from a regular jail where he would have been beaten to death by other prisoners. Bob Dylan wrote a famous song on this incident, Lonesome death of Hattie Carroll. Coming back to Sidhu, he seems to have made some amends. As Punjab’s urban development minister he is the first minister in the country to recently introduce car parking regulations in the whole state of Punjab. It is extremely disgraceful that our authorities cannot formulate any proper policy, cannot collect charges even from wealthy motorists parking their cars on Altamount road.